These guys are something else. 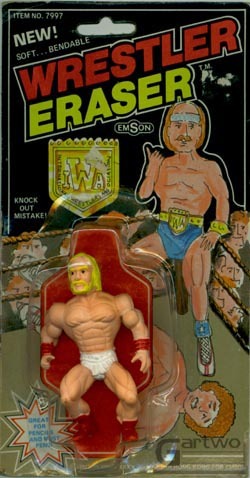 Of all knock-off generic wrestlers that tried to imitate the WWF LJN package design, this has to be the absolute worst attempt ever! Words really can't describe it, so just bask in the glory of the picture to the left for a moment. It looks like Dr. Phil's younger, slimmer brother just beat the heck out of Gabe "Welcome Back Kotter" Kaplan. Being a graphic designer who is currently having problems finding steady work, it sickens me to think that somebody actually got paid for this package design. But, it is because of all of these laughable qualities that these Wrestler Erasers have quickly become some of my very favorite figures in my collection. These dudes stand about 3" tall and were made back in 1985, although I had never seen them before untiI I just recently picked these up. I hate leaving figures in the package and am dying to open these bad boys up, but in this case I think the package is the best part so i'm making a rare exception and leaving them sealed. 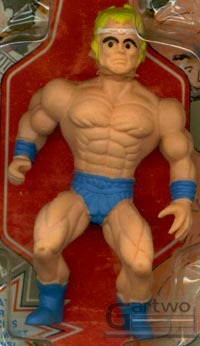 The erasers themselves are modeled exactly after all those lame generic wrestlers you always see. 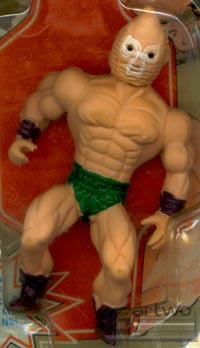 You know, the ones with the He-Man looking bodies. 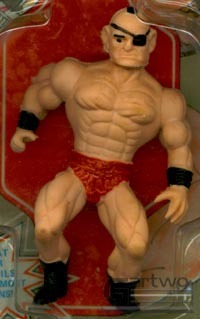 Another cool quality is the fact that these, along with the WWF Rock n Wrestling Erasers, are some of the only wrestling figural erasers ever made! 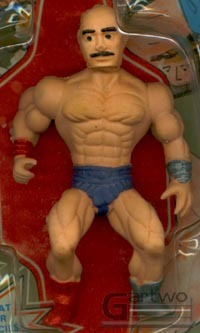 These figures also use the fictional wrestling league name IWA, which was also used by another very cool line of generic wrestling figures, the IWA Star-Studded Wrestling Bendies. The two lines aren't related, despite the fact they both came out in the same year. 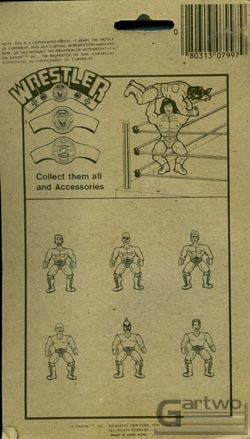 I have five of the six guys pictured on the back of the packaging, so i'm on the lookout for Wrestler Eraser #6!